Boothbay Region Fish & Game Association Director John Splaine will conduct a Range Orientation this coming Sunday, March 24th, at noon at the club firing ranges. The orientation will last approximately 30 minutes and will be held outside, so dress accordingly. As a reminder, all BRF&GA members who intend to use the club's firing ranges must participate in a one-time Range Orientation before they are permitted to shoot. Also, Club Clean-Up Day will be held on Saturday, April 27th, starting at around 8:00 a.m. and running until 1:00 p.m. or so. A pizza lunch will be provided by the club. Mark your calendar! Boothbay Region Fish & Games Association, Inc. Fish & Game Assoc. Kids’ Ice Fishing Derby Draws Biggest Crowd Ever! The Boothbay Region Fish & Game Association’s annual Kids’ Ice Fishing Derby was held on Wily Pond on Saturday, February 16th, and the weather and the fish were more than cooperative. Seventy-seven kids under the age of 16 and some 50 adults – the largest number ever -- turned out for the event. Skies were clear, the sun was shining, and light winds with temperatures in the mid-30s made for pleasant fishing conditions despite a very slushy-on-top -- but safe -- ice. Approximately 100 brook trout were caught (with many released), and 27 were entered in the contest by the 2:00 pm deadline. First place, good for $100 cash and a beautiful trophy, went to Grady Gamage for a 15 ¼” fish. Second place, for $50 cash and a trophy, was won by Sammy Doucette for her trout, which also measured 15 ¼”. J.J. Pray finished third and received $25 cash and a trophy for his 15” fish, and Avery Barter came in fourth, good for $20 cash. Ryan Clark rounded out the pack with a fifth-place trout, also good for $20. Honorable mention went to Tim Clavette for entering the first fish of the contest, Madilyn Alley for entering the last fish, and Bryce Watson for the smallest trout measured in the derby. After the fish awards were given out, Official Fish-Measurer Michelle Bryer drew door prize tickets, and every young contestant attending the ceremony at the clubhouse went home with a prize, ranging from rod and reel outfits to ice traps to bags of fishing tackle. Dean Brewer won the 50-50 raffle, and walked away with $50 in cash. Kids and adults alike enjoyed free pizza, hot dogs, hot chocolate, venison stew, pulled pork, chili, desserts and soft drinks in the heated club house during the derby. Loaner ice traps, tackle, and bait were available to those who were new to the sport, and there were plenty of willing adults with ice augers to drill holes. The club wishes to extend special thanks to those who contributed prizes and food, including Ames Supply, Big Al’s Super Values, Grover’s Hardware, T&D Variety, Steve Wood, Bobo at Hometown Convenience, Dan Williams, Dicky Bredeau, Dabney Lewis, Andy & Reese Davis, Sue Flaherty, Betty Blackman, and Paul Perry. Special thanks also to Fish & Game Club members Dennis Blackman, John Splaine, Ken Anderson, Timber Brown, and Michelle Bryer for all their contributions, and major kudos to Derby Director Martin Page for providing the trophies and for all his time and effort in putting together yet another successful Derby that went off without a hitch. As a reminder, Wiley Pond is closed to all ice fishing except during the month of February, when it is open only to kids under 16, and those with a special dispensation license from the state. Also, remember that ALL club firing ranges are closed during the month of February. ALL CLUB FIRING RANGES are closed between sunset and 8:00 a.m. (except in April when different times apply). This needs to be strictly adhered to out of consideration for our club property neighbors. This sunset to 8:00 a.m. closure has been made clear at the Range Orientations. Violations will result in termination of membership. As a further reminder, ALL members must participate in a 30-minute Range Orientation before being allowed to use the club ranges. If you haven't done one, let us know and we will try and accommodate you. HANDICAP PARKING: The club now has a designated handicap parking area (with signs) next to the footbridge. Please be advised that wheelchair-accessible vans (which are usually marked as such) need at least six feet of clear space on either side of the vehicle so the individual can get in and out. Thanks for your cooperation on this. We are trying out a new style of combination padlock on the club gate. The advantage is that the numbers are much easier to see and operate than on the brass padlocks. The four-number combination needs to be set at the BOTTOM of the lock, where there are two small, square cast "nubs" on either side of the number. The bail has to be pushed in before you pull it out. It should come right out when you set the correct opening combination. To re-lock the lock, the CORRECT COMBINATION needs to be in place, or else the bail will not fully go back into the lock body. Once the bail is fully re-inserted into the lock body, simply rotate one or more of the thumb-wheels and the lock is re-set for the next person. Any probs, let us know. Boothbay Region Fish & Game Assoc. This stand is portable and similar to the wooden stands the club often uses. The height can be increased to match your preferred shooting distance, range, and best berm impact. 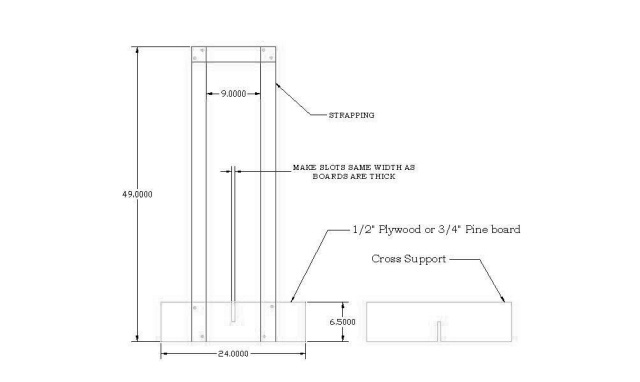 The base can be made from plywood or other available wood and comes apart for flat transportation. Works best with a cardboard backer. The Boothbay Region Fish & Game Association has made the decision to require all members who intend to use the ranges, both new members and existing members, go through a short, one-time Range Use & Safety Orientation. New Members will need to take the orientation before they will be issued badges and ID cards. Existing members will need to take the orientation before, or when they renew for 2019 in order to use the ranges. Renewals for 2019 can be made anytime from now into 2019. Members will be asked to sign a copy of our Range Rules to indicate they have completed the orientation and understand the rules. More orientations, conducted by Keith or other club officers, will be held in the future. Members who do not plan to use the ranges at all do not have to participate in the orientation. However, these members will be prohibited from using the ranges at any time and will be removed from the club if they do. The whole idea of the orientations is to be sure every member using the ranges understands how the ranges operate, what is required for safe shooting, and the range rules. Successfully completing the orientation and signing the Rules Sheet will indicate to the club that the member understands the rules and protocols of our firing ranges. Boothbay Region Fish & Game Association, Inc.
Another big thank-you goes out to Keith Royal for all his efforts in keeping our driveway and parking areas plowed out for meetings and for access to the ranges and buildings. And many thanks to Dennis and Ken for snowblowing the bridge and path. Great job everyone! 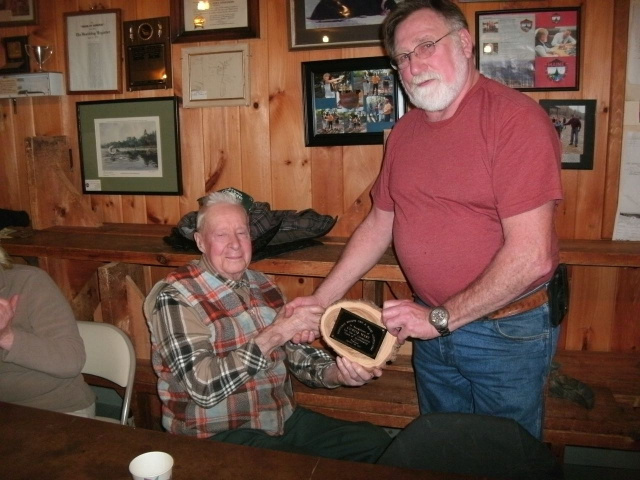 President Dennis Blackman, right, presents Curt West of Boothbay a special plaque commemorating Curt's 67th year as a member of the club. Curt joined in June of 1949 and has been a faithful member ever since. 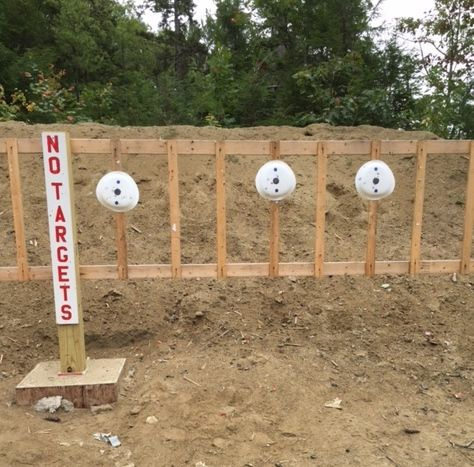 Do NOT place targets on the upright posts with the post in the center of the target. Your shots will destroy the posts and create a mess on the range requiring unnecessary maintenance. 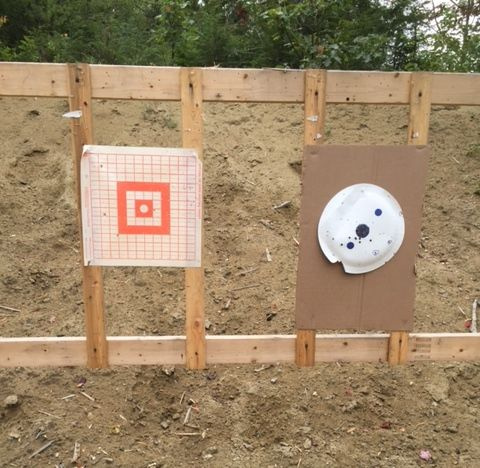 Always fasten the targets between the posts using a backer board if necessary. 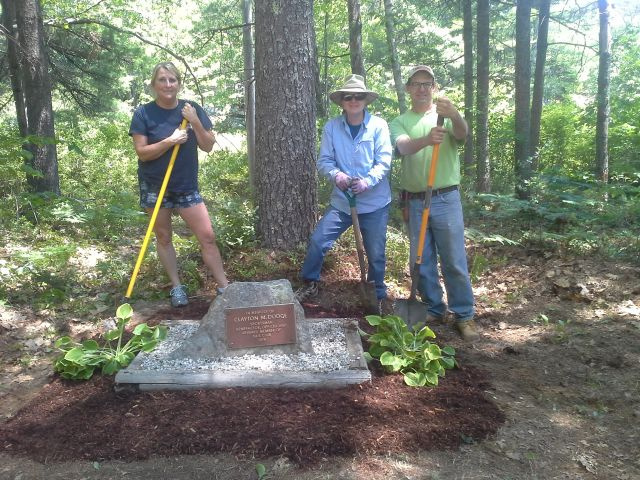 Refreshing the Clayton Dodge memorial at the club with Hosta at spring work day. The "hot range" flag pole has been installed at the gate and red flag ordered. After the flag has arrived, members entering the club driveway to shoot should raise the flag to let others know the range is hot and the last to leave should take it down and store it in the box at the bottom of the pole. Range safety is primary, please do your part. Thanks. When fishing Wiley Pond from a watercraft life jackets are required by law. Children under 12 should wer them on the fish pier. There is a 2 trout limit and only artificial lures and flies may be used.